These days, Elena Reid is a busy woman. The 29-year-old former champion in both boxing and mixed martial arts is not preparing for a fight, however. Reid is currently planning her October wedding and just closed on her first house. Fighting is the last thing on her mind, and she couldn’t be happier. One year ago, Reid was fighting through a serious knee injury and dwindling fight purses in order to continue to compete in boxing and MMA; two sports that she loves. Foregoing surgery on her knee, Reid reflected back on her life and contemplated her future in combat sports. A change was in order. Born on November 1, 1981, Elena Reid grew up in Phoenix, Arizona with a supportive family who watched as she gradually became one of the top female boxers in the world. Reid first began training in karate and kickboxing at a young age. At 18, the southpaw had her first professional boxing match in front of family and supporters in Phoenix. After four rounds, Reid was awarded a one-sided decision victory. Her career as a professional fighter had begun. Eleven years and three championship titles later, Reid’s focus has shifted dramatically as she maintains a new business and works in her community. Her passion still lies in boxing, a sport which she would like to compete in one more time, but as it became more and more difficult to make a living as a fighter, Reid decided that it was time to move on. As she looks back on the ups and downs in her career, Reid hopes to inspire change so that others can pursue their dreams as full-time professional athletes. “I’m really just a happy person,” Reid says. “I’m sure that I was just born that way, and I’m really happy because I went through this tremendous career. I was able to do so many things, not only in the female realm, but I was able to be in Ring Magazine many times and I made Plays of the Day for knockouts. I was able to do a lot of things that not too many females get to do, but I got to do them as an athlete. “I never had to pose naked or any of that stuff,” she adds. “Not that it’s wrong, but that was never for me and never what I wanted. I wanted to be noticed as an athlete and I feel that I have that recognition to a point. I have the respect from my peers and I really did it my way, which was not the easy way by any means, but I can leave and walk away knowing very much that I had the respect of my peers. As Reid talks about her career, the passion in her voice is clear. Never one to give any less than 100%, Reid spent countless hours in the gym honing her craft in order to become one of the best fighters in the world. Staying positive has not always been easy. Reid encountered more than her fair share of obstacles and heartaches to overcome during her time as a boxer and mixed martial artist. 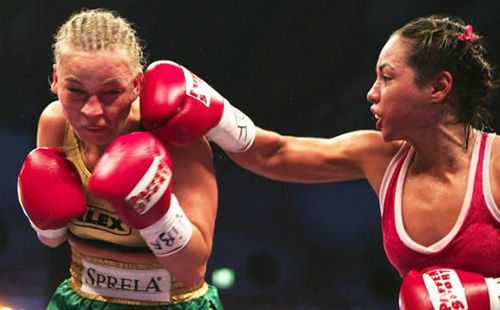 After amassing a record of 14-1-3 in four- and six-round boxing matches, Reid received an opportunity to face 45-1 standout Regina Halmich on September 11, 2004. The bout was to be contested for the Women’s International Boxing Federation Flyweight Championship in Halmich’s home country of Germany. It would become a pivotal turning point in Reid’s career. Following ten hard-fought rounds, a jubilant Reid grinned ear to ear as she patiently awaited the judges’ decision. She posed for photos alongside Halmich, who raised Reid’s arm in an apparently acceptance that Reid had been the better fighter that night. Having appeared to have won at least seven rounds, the outcome of the fight seemed to be a foregone conclusion. In mere moments, Reid would claim victory and would earn her first major title. It was not to be. The scores were read in German. The result, a split draw. One judge scored the fight 97-93 for Reid. A second returned an even 97-97 verdict. The German judge totalled a mind-boggling 98-94 card for the hometown fighter, Halmich. A confused Reid was unsure of what was going on. She turned to Halmich, who offered an embrace and explained that it was a draw. The German crowd, fully aware of the situation, cheered the American and voiced their displeasure with the decision. Reid’s bright smile from minutes earlier was long gone. She fought back tears as she and Halmich posed for more photographs. Where some fighters may have given up after encountering such a heartbreaking and seemingly unjust situation, Reid persevered with the help of her family. Had to stop reading after you gave credibility for her fighting tammie schneider lol 3-11 record, worst mma fighter next to stephanie palmer. . . and waterson is ok, but then she wanted a title fight w alyx hess luck? Isnt she also 1-6? And for her to say it was supposed to be an ‘easy’ fight? If she has so much boxing experience and is so talented why is she trying to powder her record with easy fights? Thats really all this article did for me was clarify how prevalent this mindset is in womens mma. And dont blame it on her manager. If girls want tough fights theyre out there. Elena is a talented boxer, focus on that instead of sugar coating her mma skills or lack there of. Your comment is fair, but does need context. Tammie and Stephanie only had two fights apiece when they fought Elena, who had none and one in MMA, respectively. And neither of those fights were presented for giving credibility, but rather just to state that they happened. Alyx Hess was 2-2 when she was to fight Elena, and was put into the fight after a couple of other fighters with better records declined the fight. So, I’m not disagreeing with you, but just adding context. Her MMA career did not really begin to develop until her third fight, and there were all sorts of changes that went on before the final one; none of which she had any control over. She just fought who was put in front of her because some other fighters turned the fights down. I added a brief note about that for better context in the article itself, as that was my error in not doing so previously. Thank you for the comment.